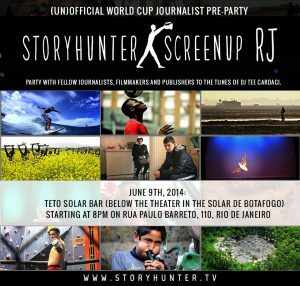 RIO DE JANEIRO, BRAZIL — Storyhunter, a platform that connects content publishers with a network of professional video journalists and documentary filmmakers around the world, will host a free “Screenup” event tonight at Teto Solar in Botafogo beginning at 8PM with music provided by Rio’s Tee Cardaci from Strategic Sounds Rio. Networking event for journalists, freelance videographers and photographers just before the World Cup kicks off, image by Storyhunter. Screenups are monthly events held in New York, hosted by Storyhunter, where video producers screen their latest work, meet editors from a range of publications and hang out with colleagues to trade stories. With the world’s biggest sports event approaching, this is an opportunity to mix and mingle before endless days of reporting and nonstop work. Storyhunter is also celebrating its launch of the first-ever open platform for publishers to find, hire and pay freelance video producers anywhere in the world. Publishers such as Al Jazeera, Fusion (Univision/ABC), Newsweek and ABC News will be using the Storyhunter platform to hire freelancers to cover the World Cup games. This is a great opportunity for freelancers to sign up with Storyhunter to work directly with these publishers. Joining the Storyhunter network is free. “We may organize smaller informal meetups and happy hours in the next few weeks, and we plan on having more ScreenUps in Rio on a more regular basis, however nothing is formalized yet,” says Ragir.